I must admit it, I am a big cynic. I have seen so many advertising and marketing claims about self-proclaimed great products that turn out to be just outright lies and misrepresentations, I have a hard time believing such pitches any more. So when HRT (High Resolution Technologies, Los Angeles, CA.) talked about their iStreamer at the last Macworld | iWorld conference, I just rolled my eyes in disbelief. I connect my iPhone and iPodTouch to my rather high-end audio system all the time with a simple headphone jack to RCA stereo cable, and for the most part, it sounds fine. Yet, here was this company telling me that I was not getting the full experience of my music from my iOS device. Really? Just how so? So when I was given the chance to borrow an iStreamer unit and test it, I jumped at the chance. I was ready to prove them wrong. The solid, well designed unit arrived in a small box, and includes the iStreamer unit (about the height and width of an iPhone 4, and a little less than an inch high), a fairly small wall power supply, a plug adapter for the power supply for the proper country, a special iPhone/USB cable, a longer USB/power cable, and an RCA audio cable to connect it to an audio system. HRT makes two versons. One is designed to use a wall adapter and standard household power, from 115v to 240 VAC, while the iStream 12v comes with a 12v power adapter so you can use it in a high-end car or boat sound system. I also liked that all HRT products are designed and manufactured in Los Angeles, CA, rather than designed here, made in China, and imported back. 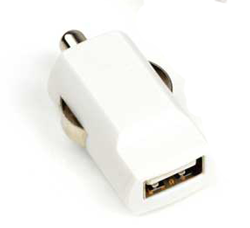 On one end of the iStreamer are two USB connectors and three LEDs. The other end has two female RCA jacks, which connect to a stereo system. Set up is easy, but needs to be done in a particular order to make it work correctly, and instructions are included to get you up and running. According to their website, the device supports the iPod Touch (1st through 4th gen), iPod Classic, iPod Nano (1st through 6th gen), iPhone 4, iPhone 3GS, iPhone 3G, iPhone, iPad, iPad, iPad 2, and the New (2012) iPad. It did not list the iPhone 4s, but given that list, I can’t imagine it would not, but you might want to check with them first. After connecting it to my stereo and powering it up, I connected it to my iOS device with the included USB cable, and the iStreamer paired to my iPhone in a few seconds. 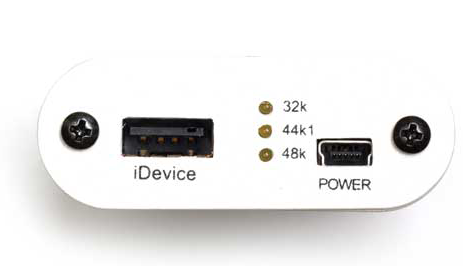 Once paired, the iOS device will be powered by the USB cable (and charge the device too), and one of the three LEDs on the iStreamer will start to flash indicating all is working correctly. I launched the music app, picked a song, and clicked play. One of the three LEDs lit and the song played through my audio system (and it knocked my socks off, but more on that later.) Besides indicating that the unit is working, the three LEDs also indicate the digital audio sampling rate being converted by the iStreamer at 32k, 44.1k, or 48k. As music plays and songs change, the LEDs change too, indicating the sampling rate of the music is properly being tracked and converted by the iStreamer at the proper audio rate. 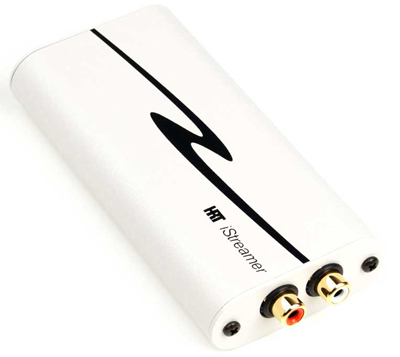 The iStreamer is a high performance DAC, or digital to analog converter, which takes the raw bits of your digital music from your iOS device, and does the digital to analog conversion outside the phone on a very high quality DAC. Yes, your iOS device also has a DAC, but it is nowhere near the quality of this device. Put bluntly, your music should just sound better if the hardware decoding the digital files is of higher quality. Also, when the iStreamer is paired to an iOS device, it connects with something called “host mode interface”, where the iStreamer basically takes complete control of the data exchange between the two devices, using it’s own internal clocks. This method completely eliminates “jitter” in the digital stream, locking the data transactions (transfer) to the iStreamer’s clocks, where the DAC resides, and not by the iOS device’s clock, which is not as accurate. Lastly, to reduce cost, this was designed with ONLY the iOS devices in mind, and only supports audio formats that Apple supports. 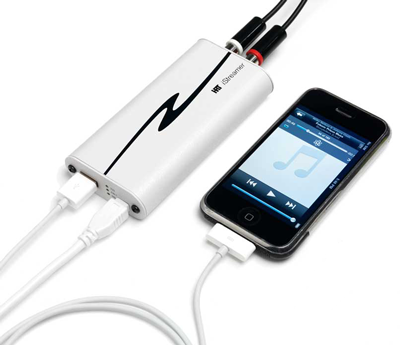 That allows fewer, but higher quality parts to be used, resulting in better sound reproduction. What does that mean on your planet? But now you need to get the sound back from the 1’s and 0’s of the digital file to waveform analog audio. Independent of how the audio is encoded, there are a few items that will greatly effect the playback audio reproduction quality. The most obvious ones, the amplifier and speakers (or headsets) are of course important. If you are considering this device, I will assume you have some form of high quality audio playback system, otherwise, this is all moot. But foremost in converting the digital back to analog are the digital to analog converters (DAC) used to do the conversion. The better the quality of this DAC, the better the sound reproduction will be, and frankly, the DACs in iPhones and iPads are not as good as they could be because really good DACs are expensive. Also important is making sure that the digital data gets to the DAC at exactly the time it is needed. When the data does not arrive on time (either late or early) we have something called jitter, and excessive jitter causes phase modulation in the music which, in turn, seriously effects the music quality in many ways. (Here is a good article if you want to know more.) Since the iStreamer controls the data transfer from the iOS device, it can take the data when it needs it, and completely eliminate jitter, and, that also means better music reproduction. So, assuming you have a decent stereo system for playback (and not some small speakers and tiny amplifier like you might put in a kitchen), and assuming you want the best sound you can get from your digital files, then the iStreamer is a solution for you, and yes, it works! I really did not think this device would make that much of a difference. Given Apple’s reputation in the audio field, I would hope that the audio reproduction from an iPod or iPhone would be great. And frankly, it is really not that bad at all. But, sadly, the typical way most people connect their iOS device to their stereo is the same way I do: via a mini-plug in the earphone jack to a set of RCA stereo inputs on the stereo. This signal path, including the small amp that drives the headphones, and the medium quality DACs in the iOS device gives good, but not great sound. So I played a few of my favorite songs in my normal way. They sounded fine. And then I switched my amp to the use the audio from the iStreamer and played those same songs again. I was stunned! The music seemed to jump from the speakers and fill the room in an entirely different way. The frequency response was amazingly wider, the sound more dynamic, with crisper highs and much better lows. The overall sound was richer and warmer than before, having more depth and clarity than I have ever heard from my iPhone through my stereo. Switching back and forth between the two methods, the difference was plainly obvious. When compared to a DVD on a high end DVD player, it was difficult to tell the difference between the iStreamer and the original DVD source. I was sold. Or was I? While the difference in sound was truly amazing, this did not seem to be a cheap alternative to me. At $199 (plus tax in my state), you have to really notice how badly your current setup sounds, or really want the best audio you can get, or have such an expensive audio system, that cost is not an object. And quite frankly, while this is a significantly better solution than my current one, is it $200 better? For me, the answer was sadly, no. (Disclosure: HRT offered me my demo unit at a discount, and I still passed.) For half the retail cost, I would have jumped at this in a hear beat, but given that my current set up was good enough before, at nearly $200, it will have to be good enough now. That said, when I started looking for other high-end DACs for the iPhone, turns out this is considered one of the most affordable options. If you are using Bluetooth speaker systems, or a small stereo with small speakers to listen to your iOS device, then there is no real reason for this product. You will not hear the difference. On the other hand, if you have a high end stereo, and $200 is not a concern, and you want the best sound you can get from your iOS device, then this is an excellent solution for you. You will hear the difference. I sent the demo unit back today, and I already miss it. MyMac.com Review Rating: 8 out of 10. A lower price, and this would be perfect!